Everyone has the occasional bad day at the office, when everything seems to go sideways and you just wish you could curl up in a ball. It's a feeling at least one American Airlines flight attendant can relate to, after she spilled an entire tray of drinks she was serving onto the company's CEO last week. Ahead of an American Airlines flight from Phoenix to Dallas on April 4, flight attendant Maddie Peters and the the rest of the crew were alerted that the company's CEO Doug Parker would be on board, so they all naturally intended to be on their best behavior. 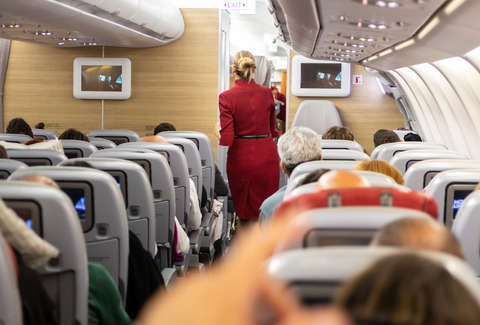 However, things didn't quite pan out as planned for Peters, because just as she was offering beverages to the passengers in first class, someone bumped her from behind, and sent the full tray of drinks flying all over the CEO. It was obviously an accident, but Peters understandably freaked out at the scene she'd caused. "I wanted to drop dead right there," Peters wrote in a caption to an Instagram photo of her and the CEO she posted later. Luckily for her, Parker was a good sport about it all, and laughed it off, according to NBC News, who recently spoke to Peters. In her four years working for the airline, she has apparently never spilled a drink on a passenger. "I asked him, 'Am I fired?' and he said, 'Of course not,'" she said. After the big spill, Parker came back to the plane's galley in back to chat, and they evidently joked about the whole thing for the rest of the flight. As he was disembarking, he even told her he'd "never forget [her]" which she figures can only be a good thing and not a promise to later punish her for the unfortunate event. If and when you screw up at work next time, just be glad you at least didn't soak your boss's boss's lap with soda. Also, please don't bump flight into attendants while they're working in the aisle. You could really screw up their day.